Let's talk about fishing for bass! We offer a variety of ways to fish for bass in the Ozarks. We can wade in the numerous creeks, streams and rivers in the area(most are within an hour drive of the Branson area) We can float in a canoe (please give me at least 3 days notice if you would like to try this method) down some of the most beautiful scenery in the Ozarks. Fly fishing for bass is a completly new concept in the area! There is NO ONE else that guides fly fishing for largemouth and smallmouth bass. 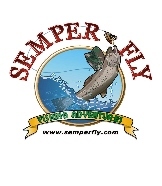 Semper Fly Fishing Adventures wants to keep your fishing experience an ADVENTURE, therefore we do not use a boat. We can either wade or use a float tube . The float tubes are very stable, safe and most of all, stealthy. You use flippers (just like divers) to get around. The fish won't be spooked by an engine or large shadows. The tubes sit up high in the water and come with a headrest and built in tackle boxes. We promise this to be a truly wonderful way to spend a few hours in the water. Oh yeah, you may even catch a fish or two! 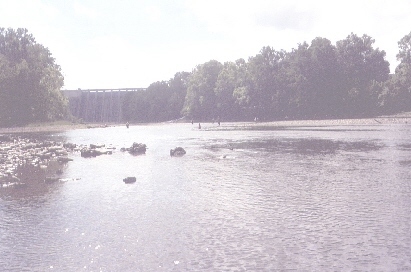 Wade fishing is dependant upon water flow from Table Rock Dam. If you are not comfortable fishing with the power generators running, we will either refund the part of the day you did not fish, or re-schedule with you.